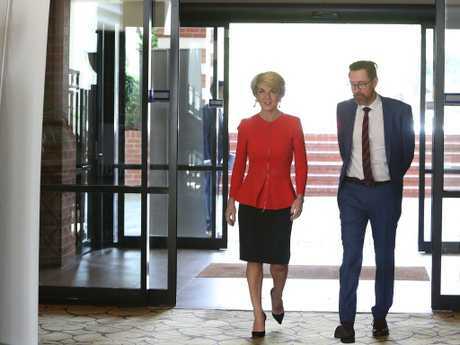 Ms Bishop stepping out in these killer red high heels was seen as her final power move when she resigned as foreign minister after August's Liberal leadership spill. At the yacht event today, she stepped out in another statement pair of red heels and the same earrings she wore the day she announced she was resigning from cabinet - marking another strong female power move. She wants to see the 13-strong women crew take the Tattersall Cup - and while she won't join them on board, she'll see them off and plans to pop champagne at the end. 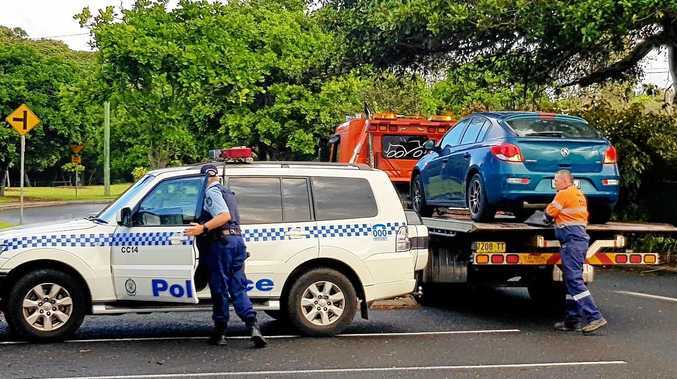 "It's just part of something I decided to wear today," she told news.com.au. "I have a passion for red shoes." 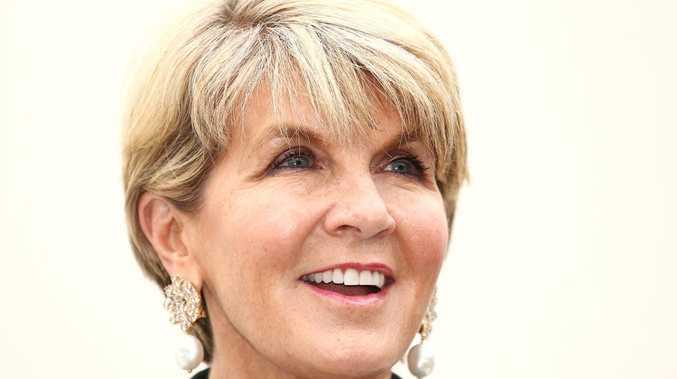 Ms Bishop made a blistering speech to an Australian Women's Weekly event after her failed leadership tilt, pointing out the difficulties she had experience as a female MP. "Perhaps I'll have some insights," Ms Bishop said of her impending speech, signing off with the red heel emoji. Red has become the colour to symbolise today's gender equality struggle, whether Ms Bishop admits it or not, with celebrity feminist Lena Dunham, last year proclaiming "the revolution will wear red lipstick". 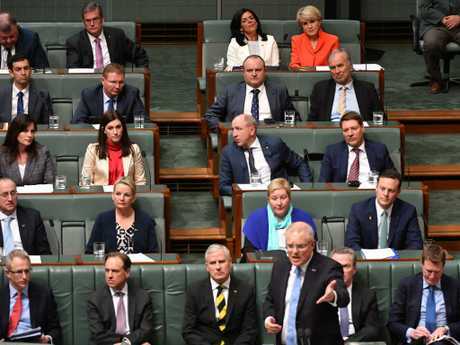 The colour has been donned at International Women's Day protests around the world, and now it sits squarely in the blue benches of parliament. The statement red jacket has become a signal among outspoken female Liberal MPs including Ann Sudmalis, Julia Banks and Kelly O'Dwyer. At the time a debate was raging over the Liberal Party's treatment of women and its struggle to boost its female representation. "I am a female politician. People can judge me by what I do, not how I self-describe." "I think politics will continue to evolve," she said. "What we're trying to ensure is more females in parliament so we have a closer representation. "We can all do more to boost female representation." Ms Bishop said history was full of stories of women disguising themselves as men to compete in man's world. Skipper Stacey Jackson who assembled the crew said they might have to call on Ms Bishop to get advice on how to "wear shoes like that". 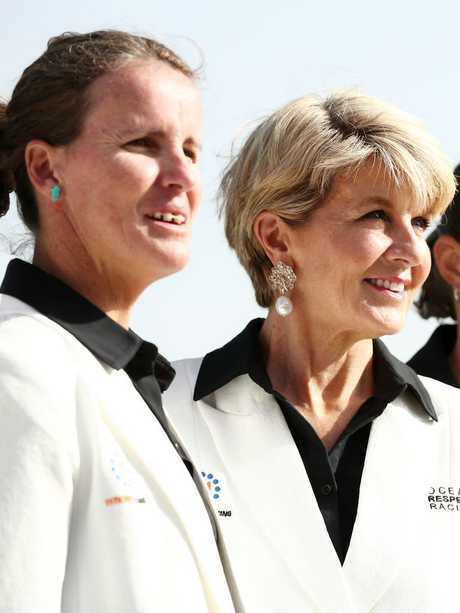 Ms Bishop also wore the same beautiful pearl Margaret McKinney earrings.